Talk about variety! 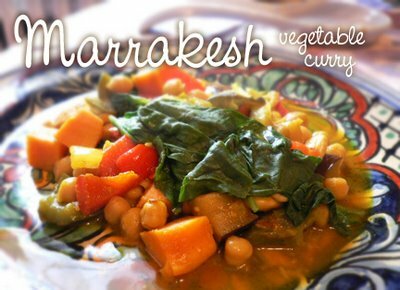 This dish has loads of different vegetables and spices, rounded out with hearty chickpeas and scrumptious almonds. Served with couscous or quinoa, it's a filling and nutritious meal with delicious aroma and enticing colours! In a large Dutch oven or soup pot, place sweet potato, eggplant, peppers, carrots, onion and 3 tablespoons oil. Sauté over medium heat for 5 minutes. In a medium saucepan place 3 tablespoons oil, garlic, turmeric, curry powder, cinnamon, salt and pepper and sauté over medium heat for 3 minutes. Pour garlic and spice mixture into the Dutch oven with vegetables in it. Add the garbanzo beans, almonds, zucchini, raisins and orange juice. Simmer 20 minutes, covered. Add spinach to pot and cook for 5 minutes. Serve! Fantastic as usual. Cooked this for dinner tonight, served with wholewheat couscous and red pepper hummus. Mmmmmm..
For the pitta dosha, I replaced spinach with Scots kale.